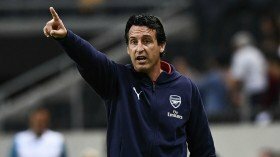 Arsenal manager Unai Emery has indicated that the club may not pursue any new players when the transfer window reopens at the turn of the year. The Gunners have been hampered by multiple injuries during the first half of the current campaign and they are already without Rob Holding and Danny Welbeck for the rest of the campaign. Despite this, Emery has indicated that the club may not recruit any players in the New Year with rival clubs likely to be reluctant to do business in the winter transfer window. "It is not easy. But I don't believe I would in this transfer window because it's not a very big possibility with the players," he is quoted as saying by Sky Sports News on Sunday. Arsenal suffered their first defeat in any competition since August on Sunday afternoon after they were beaten 3-2 on the road to Southampton. The Gunners are now three points adrift of the Champions League spots.